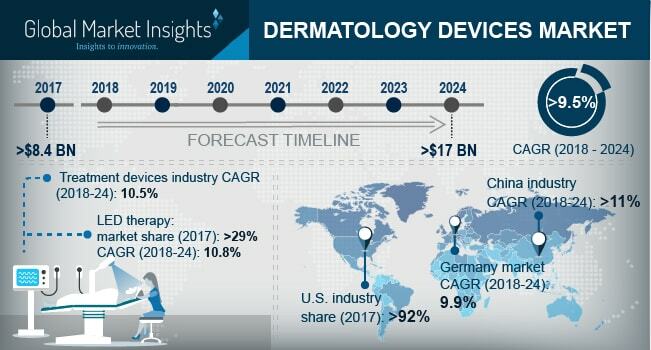 Dermatology Devices Market size is set to exceed USD 17 billion by 2024; according to a new research report by Global Market Insights. Growing occurrence of skin cancer as well as surging number of skin cancer new cases are factors driving dermatology devices market growth. Increasing disposable income and increasing awareness of skin disorders coupled with growing spending on treatment of skin problems are aspects rendering positive impact. Surging demand for cosmetic procedures and availability of advanced treatment boosts industry growth. Skin rejuvenation segment is projected to grow significantly over the coming years. The growth attributes to increasing cosmetic procedures demand and advancements taking place in lasers. In addition to, skin rejuvenation also reduces acne scars appearance, stimulates production of new elastin and collagen. Liposuction devices segment will grow substantially during the forecast timeline due to advanced technology such as, radiofrequency assisted, suction assisted lipectomy coupled with rising demand for cosmetic procedures. The industry players emphasize on launch of enhanced dermatology devices and acquisitions. For instance, in September 2015, Solta Medical launched Clear + Brilliant pelo that is a new device with linear scanning technology for laser hair removal. Moreover, launch of this device also joins portfolio of Solta Medical’s solutions with German Medical Engineering (GME), that develops aesthetic energy devices.